The new Rikta-ESMIL has become more portable and effective. It is possible to compare Rikta-ESMIL-1 apparatus to the whole clinic! To cure more than 200 different diseases, illnesses and pains the huge hospital with the whole medical staff and expensive equipment is required. For those who has gained Rikta-ESMIL-1, there is a possibility to combine all this in one small apparatus. 3. Pulsating broadband red radiation (visible) of semi-conductor light-emitting diodes, penetrating on slight depth, has beneficial effect, reducing intensity of inflammatory processes in a skin and hypodermic cellular tissue, especially in zones of areolar tissue. Rikta device influences on human's bioactive zones with low intensity electromagnetic radiation and stimulates organism's own vital resources, improves circulation of the blood and intensifies the immune system, has anti-inflammatory and analgesic effect. - from medicine up to animal industries, veterinary medicine and plant - growing. 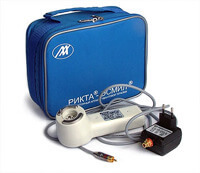 The Rikta-ESMIL-1 apparatus is compact and portable. You can even take it with you on trips putting it in a small handbag, so you do not have to interrupt the treatment course. Compact, suitable in usage. The maximum simplicity in instruction manual. Very detailed instructions and schemes of apparatus application with methodical recommendations at treatment of different diseases, illnesses and pains. It is not necessary to be a doctor to handle the device. The instruction manual is in simple English language and has special healing programs for each method of treatment (more than 200 diseases, illnesses and pains). Also the manual includes recommendations at Rikta?s application in Cosmetology, Veterinary medicine and Plant cultivation.